Japanese translators: quality is everything. We are one of the few agencies with in-house expertise in languages such as Japanese and Chinese. No translation is ever proofread by a third party. All final editing is carried out by us, from start to finish. Akebono does not employ generic project managers, but linguistic experts with excellent academic qualifications. They are your direct point of contact. Numerous large companies, as well as smaller companies and government agencies are proud to entrust their translations to our agency. We take a Japanese attitude to service: in Japan the client is not king but God, and Akebono Translation Service reflects this. Did you know that we answer all e-mails within one hour? And that you get a 10 EUR discount for any and every translation mistake you find? Take a look at our testimonials page for added reassurance that your translations are in safe hands. We do not believe in waging price wars, because translators with a university degree cost more than the minimum wage. That is why our agency has been delivering translations of the highest quality for more than 24 years. Akebono is managed by Loek van Kooten, who has an MA in Japanology, and his wife Rumi Tasaki, a native Japanese speaker who majored in English Literature. Loek and Rumi have been full-time Japanese translators since 1995. 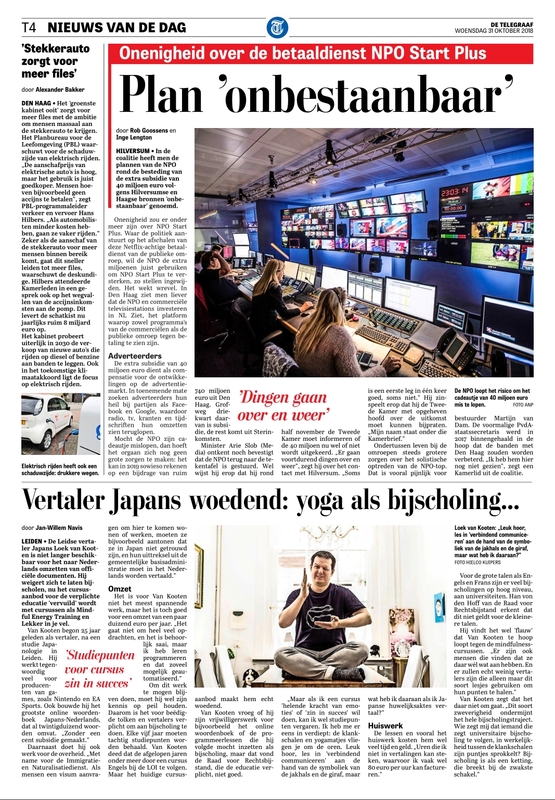 We were featured in the biggest Dutch newspaper: Why we no longer certify translations (link).